NOTE: To learn how to use the Pencil tool, see About the Pencil Tool. Defines the number of control points added to the centre line. The fewer the control points the smoother (but less faithful) the line. 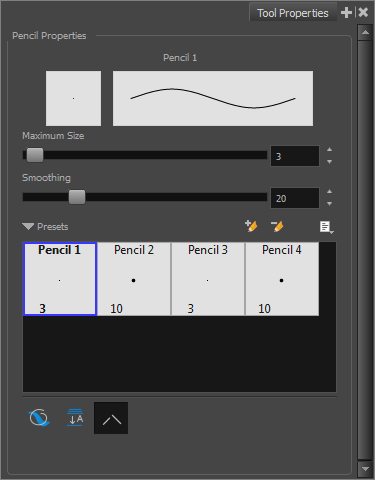 Harmony provides a variety of pencil presets and also lets you create and save your own. It is a good idea to create and save pencils with precise sizes and parameters when you draw and design for efficiency and consistency. Allows you to import a set of XML Harmony presets previously exported via the Export Brushes command. Allows you to export Harmony presets to backup or import on a different computer.